The past weak saw a special anniversary celebration, which is in no calendar of national events: 30 years since NGOs started to work in Cambodia. Nowadays, when the participation of NGOs – foreign and national – is assumed as a regular feature of life in society, it is surely not easy to understand the extraordinary nature that foreign NGOs came to Cambodia in 1979. At that time, the majority of UN member states considered the Cambodian government to be illegal. The so called “Western” countries and the People’s Republic of China agreed on the point that the Khmer Rouge representative continued to legally represent Cambodia at the United Nations until 1990. Seeing this agreement between these two world powers normally not much in agreement, many Third World countries went along with this understanding. Only the socialist countries (except China) and India established diplomatic relations with the government in Phnom Penh after the end of the Khmer Rouge regime. And US citizens, working in Cambodia, even if their salaries did not originate from the USA, had to pay “punitive taxes” in the USA. “It is very moving to look around this room and to see so many people who have contributed to the Cambodia in which we live today. How far we have come since 1979! This history has to be remembered, when nowadays, sometimes the opinion is expressed that NGOs have one role only: “to provide humanitarian assistance” – quite different from the wide variety of activities NGOs are engaged with in other countries of the world. All the more it was interesting that also the keynote speaker, Ingrid Srinath, Secretary General of CIVICUS (“Promoting a worldwide community of informed, inspired, committed citizens who are actively engaged in confronting the challenges facing humanity” – with member organizations in 110 countries), described the fundamental task of civil society not just in terms of development or humanitarian project implementations, but located their role in the present situation, after the collapse of many schemes based on an free-market system, where human rights an democratic are more under threat than before. “Doing so will take more than a business as usual approach from us. It will take each of us as individuals, organizations and alliances setting aside our egos, our brands, our narrow self-interests and our differences to come together in unprecedented levels of collaboration and genuine partnership that focuses on amplifying the voices of those least heard, and of finding common cause across boundaries of nationality, geography and thematic interest. The address of the Prime Minister dealt, according to reports, a lot with the planned NGO Law. There is some apprehension among the NGO community, because a current draft is not available for public discussion in the community. Some examples given, why an NGO Law is important – like to prevent terrorist acts planned under the cover of NGOs – were widely not seen as convincing: the intended terrorist attack against the British Embassy had been stopped in time, and the Indonesian terrorist Hambali was arrested – both without an NGO law. Here are obviously some misunderstandings about administrative processes involved. In addition, most donors, providing financial resources to NGO, have requirements for professional auditing, and the results are not secret. Compared to the recent calls by the Prime Minister to curb multiple remuneration payments to government advisers, combined with the repeated calls by the Prime Minister to economize gasoline usage by a better control on the use of public vehicles, allows the assumption that the handling of finance in the NGO world is comparatively well organized and transparent. What is important, therefore, is the clear statement of the Prime Minister, that the NGO Law will not interfere with the normal activities of NGO: “I guarantee that it is not an action to restrict the freedom of NGOs, please believe me.” Should lower level authorities try to act differently, civil society can appeal to this public promise of the Prime Minister. “Phnom Penh: The Appeals Court of Cambodia issued a surprising decision, sentencing Ms. Chea Ratha [a former military police brigadier general, who had a lesbian relationship with actress In Soklida] for 18 years to jail for an acid attack against the aunt of the actress In Soklida, and also other accomplices are to be imprisoned. The decision made by the Appeals Court at this time is totally in contrast to the former decisions made by the Phnom Penh Municipal Court to dismiss the accusations against the accused persons. “The acid attack against Ms. In Soklida’s aunt had been brought for a hearing and judgment by the Appeals Court on 27 November 2009, with Mr. Seng Sivutha as the head of the council of judges, with Mr. Nhoung Thul and Mr. Thou Monei as members, and with Mr. Hean Rith as representative of the prosecutors. “The judgment decided to uphold Decision 82, dated 31 August 2009, of the Phnom Penh Municipal Court, but rejected Point 1, which is related to punishments for all who had been charged. The new decision of the Appeals Court exempts Meas Mao, male, 40; and Meas Chandy from the charge of illegal gun use, but sentenced them to serve 18 years in prison for violating the right of an individual, and for planned and attempted murder. Chea Ratha, female, 43, was removed from the charge of illegal use of a weapon, but she is convicted to serve 18 years in prison for planned and attempted murder. Ie Puthea, male, 33, and San Savuth, called San Sanut or Nut, 29, were freed from the charge of using a weapon illegally, but are to be imprisoned for 15 years for violating the right of an individual, and for collusion in a planed and attempted murder. Siek Sophal, male, was removed from the charge of using a weapon illegally, but is to be jailed for 15 years. Chan Dara, male, was removed from the charge of using a weapon illegally, of violating the right of an individual, and of collusion in an attempted murder, that means he is free from all accusations. All the six accused persons were ordered to pay to cover the cost of the medical treatment and to compensate the plaintiff with US$100,000, and an arrest warrant was issued to arrest those who escaped. “It should be noted that the acid attack against Ms. In Soklida’s aunt occurred on 8 May 2008 in front of the RHAC Hospital on street 433, Tuol Tumpung 1, Chamkar Mon, Phnom Penh. “The Phnom Penh Municipal Court had sentenced to dismiss the accusations against all accused persons, but the plaintiff’s lawyer later appealed against this judgment, and there was also a complaint from the prosecutor of the Appeals Court dated 23 September 2009. “The reason leading to this new judgment is that there was an acid attack against the victim Ya Sok Nim, Ms. In Soklida’s aunt, by two unidentified persons, who rode a 2008 Viva motorbike, and then stopped behind her to attack her with acid, and escaped. “After the event, the victim’s husband lodged a complaint to the authorities to solve the case according to the law, but he could not identify the perpetrators’ faces. “According to a note of the victim read by a clerk, a day ahead of the attack, bodyguards and Chea Ratha came to her house to ask for information about her niece (In Soklida), but she said that she did not know where she was. They asked to check in the house, but they still could not find her. Then they left. “A few days later, Chea Ratha phoned to warn her, ‘If you do not deliver In Soklida, there will be bloodshed.’ This i was recorded, and her voice was played in the municipal court. Later on, the acid attack happened on 8 May 2008. “Sok Chey, a person who witnessed the event, said he saw two men, whose faces he could not identify as they wore masks, but remembers their appearance, as they appeared behind the victim, attacked her with acid, and escaped. “After that, police arrested two perpetrators, after showing their photos to the victim. The victim was sure that they were the perpetrators, bodyguards of Chea Ratha, as the victim had gone to the accused’s house [Mr. Chea Ratha’s house]. “The rector of the Chamkar Doung Royal University of Agriculture, Mr. Chan Nareth, is accused by lecturers working under his administration of being involved in corruption to take between US$300,000 and US$400,000 university resources each year. 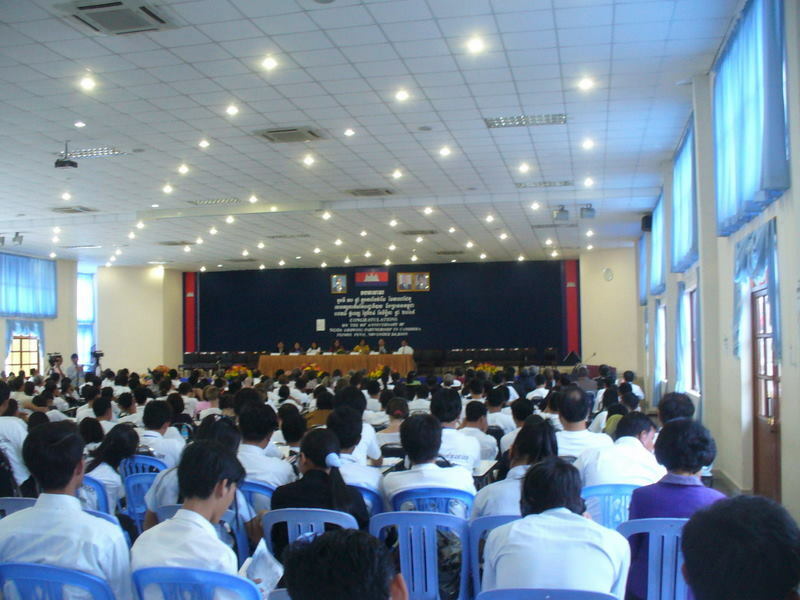 “A local website wrote, following the claims of many lecturers, staff, and civil servants of the university, that Mr. Chan Nareth took the money, income of the university, for himself alone, while lecturers, staff, and civil servants receive only small salaries that cannot even support their daily living expenses. “The lecturers describe on the website their accusation against the university rector Chan Nareth, claiming he commits corruption for his own interest, and at present he has luxury cars and several residencies. “The Royal University of Agriculture is located in the Meanchey district of Phnom Penh; it is also called the Chamkar Doung School or the Chamkar Doung University of Agriculture. “The lecturer Chhum Phetlun wrote on the website that since 1999, this university started to charge tuition fees from its students, for the studies that began in 2000, so it brings in US$300,000 to US$400,000 each year. This large amount of resources was not shared with lecturers, staff, and civil servants of the university to assist their family livelihood, but Rector Chan Nareth took it alone. Because they can no longer bear the greed of their director, they decided to disclose this case through the media in order to inform the leaders so that they take action to seek justice for lecturers, staff, and civil servants of the university. “Earlier on, 72 lecturers, staff, and civil servants had thumbprinted a demand addressed to Mr. Chan Nareth to add US$6 per hour to the hourly remuneration decided by the state [for the lecturer’s remuneration], and to add additional payments for civil servants, who earn US$80 per month, and for other staff who earn US$50 per month, starting from 2010. “The lecturer Chhum Phetlun added that previously, being afraid of the power and influence of Rector Chan Nareth, all lecturers, staff and civil servants did not dare to protest, or to report anything to higher level leaders. But now, because of the rector’s greed to take US$300,000 to US$400,000 per year for himself alone, they cannot stand it any longer, and are not afraid any longer, and they decided to report it to the media to help to bring this message to the leaders, especially to the Minister of Agriculture, Forestry, and Fisheries, Mr. Chan Sarun, to learn about the difficulties of lecturers, staff, and civil servants of the Royal University of Agriculture of Chamkar Doung. “Adding up the amounts of US$300,000 to US$400,000 each year from 2000 to 2009, it comes to as much as US$2,700,000 to US$3,600,000. “Yesterday [26 November 2009] Khmer Machas Srok could not reach Rector Chan Nareth, who is being accused, for a comment. “Analysts said that in this case, Mr. Chan Nareth probably did not dare to take the money alone, there must be some other higher leaders with whom he shared it, so that he can be happy above the pile of difficulties of many lecturers, civil servants, staff, and workers. “Phnom Penh: Cambodian families lose between US$35 and US$40 million because of the global economic crisis, resulting in unemployment for 20% to 30% of the workers in the garment and construction sectors, and in tourism. As it is mainly the poor who are facing the impact, the United Nations released a report offering suggestions that can help reduce those impacts. “In the statement, the UN said that what Cambodia can do to reduce the impacts of the global economic downturn becomes more an emergency topic, as the basis of fast economic growth in the past in the garment industry and in tourism is suffering from the recession of the global economy. 20% to 30% of the workers in the garment and construction sectors and in the tourism industry lost their jobs since late 2008, making them lose between US$35 and US$40 million to be sent to their homes. Impoverished people, mostly women in the garment sector, suffer from the declining economy. “Such cases are occurring all over the country, while foreign investment for construction projects is decreasing, buying orders for garment products drop, and the number of tourists is declining also. This downturn is not only a challenge for individuals, but also for the growth of Cambodia to achieve the Millennium Development Goals. “The most serious impact from the economic downturn is happening to poor people and to people living near the poverty line, especially those having debts to repay face more difficulties. Such cases happen mostly in rural areas, from where many vulnerable people migrate to the cities to seek employment. Women are among the most vulnerable people, suffering from the impact of this crisis. After they lose their jobs in garment factories or in the construction sector, because of the lack of other professional skills, most women who continue to live in the city have no choice but to work in the entertainment service industry. The report pointed out that also the children of those women suffer under the burden of the impact of the economic downturn. “The UN had conducted a study to learn more about the impact of the global economic downturn in Cambodia, as well as to identify different measures to reduce the impact on human development already achieved, and to restart development to alleviate poverty, and to be prepared for the future. This report estimated the impact caused by this crisis at the national level as well as the impact on individual Cambodians. The report mentioned policy choices that can help to minimize the impact, including equal rights to receive incentives through lower taxes, structural reforms to improve the competitiveness of the country in the world, and reforms to develop mixed systems for national social protection, to lessen the impact of the economic downturn in the short term, and to bring sustainable and equitable growth back in the long term. “The global economic downturn creates also opportunities to accelerate reforms to prepare for the future, and to improve the competitiveness of Cambodia in the world. Recent events encourage such reforms. The UN vows to cooperate with the Royal Government of Cambodia to accomplish the country’s development goals. The global economic downturn poses new obstacles and political challenges, but provides also opportunities that cannot be overlooked. “There had been several reports that information about confidential flight plans by the Cambodia Air Traffic Service (CATS) controlled by Thai people were leaked. The opposition party has demanded that the government should take control of the air traffic control itself, but there is no response. And now everything seems somewhat too late. “In January 2001, the State Secretariat of Civil Aviation of the Cambodian government signed an agreement with the [Thai] Samart Corporation, providing an exclusive license for 22 years to this company, to organize, operate, and maintain a system for air traffic routing for civil aviation companies in Cambodia, and this company is also required to conform to the technical standards of BCT [an aviation maintenace company]. After receiving the license from the Cambodian government, Samart very quickly prepared the bidding procedure for the radar system and set up the necessary tools needed for its effective air traffic control operations. “Mr. Cheam Yeap continued to say that according to new Article 90 of the Constitution of Cambodia, the Royal Government can make a request to the National Assembly [“The National Assembly shall approve the national budget, State planning, loans, financial contracts, and the creation, modification and annulment of tax.”]. Then the National Assembly will exercise its right to cancel any contract that can affect the national interest. The Thai spy can be considered as proof to cancel that contract. Another Sam Rainsy Party parliamentarian, Mr. Son Chhay, said that the opposition party had expressed concerns since the beginning about problems of national security. Now, it happened as the Sam Rainsy Party had been concerned. He said he will write a letter to the government, because it is related to national security. “He said, ‘I also saw information about the arrest of the Thai spy. I think it is an opportunity to respond to the Ministry of Defense and the Council of Ministers which had claimed that there would be no problems, but the problem exists now, and I want to know what measures they take.’ He emphasized that he will write a letter this week to the government to request it to check the control over the CATS company. This Saturday, we reported: “According to a recent notification from the Council of Ministers, the Royal Government decided to suspend all promotions for government positions in 2010. If a promotion in any position is planned, it has to wait until 2011.” That was even more surprising than another report which the Mirror carried on 10.11.2009: “The Government Cuts Salaries of Advisers” – which, in a way, was only the correction of a violation of common sense (and economic justice): Why should only some public servants, employed full time, get a second salary for an additional function as adviser, a task to be adhered to during working hours which are already covered by another salary? But such double, or even multiple payments for some persons, seem to have gone on for years. In many other countries, the Auditor General – being an independent position without special loyalties – might have intervened many years ago. When working to select and to present texts for the Mirror, related to some new millions of dollars “to help Cambodia,” it is surprising that quite often the text does not specify whether this refers to a credit to be paid back, or to a grant. Even some statements of preference, from where it is more agreeable to receive funds – whether there are conditions of transparency or of human rights adherence part of the agreement, or whether funds come without such expectations – do not distinguish between grants and loans. Though the latter have a minor condition: they have to be paid back. Russia asks for the resumption of Moscow-Phnom Penh flights, for the promotion partly of tourism, and partly of investment. Russia asks Cambodia to strengthen military relations between the two countries by asking the ministries of defense of the two countries to have good relations again, because so many members of the Cambodian armed forces studied in Russia; therefore, the Cambodian Government should accept the request and organize those who studied military affairs in Russia again, and Russia, in turn, promises to accept Cambodian students to study in Russia. Russia sees the possibility to exploit natural gas in Cambodia, and asks the Cambodian National Assembly to facilitate relations, so that Russia can come to invest in oil drilling, because Russia has long years of experience in [oil and] gas drilling and hopes that Cambodia will allow Russian investors to come to invest in natural gas exploitation in Cambodia. We do not remember that these points – especially as they relate also to untapped oil resources – have ever been mentioned in the more recent reports about maritime oil resource negotiations with a number of other countries. It should therefore be no surprise that the latest delegation to Russia to discuss the old debts did not bring the expected solution: that Russia would simply write off US$1.5 billion. To look forward to comprehensive information about all debt obligations, in light of what economic theories say about an appropriate “sustainable external debt” ratio is not unreasonable. The recent dramatic decisions, to cut the salaries of the large number of advisers, and to freeze all promotions in the civilian and uniformed services, “aiming to save state resources in 2010,” is a signal of a new approach to handle public funds. “According to a recent notification from the Council of Ministers, the Royal Government decided to suspend all promotions for government positions in 2010. If a promotion in any position is planned, it has to wait until 2011. “Formerly the Royal Government, in addition to having already a heavy overhead apparatus with many officials, had nominated countless advisors at ministries and at other institutions, and ministers and heads of institutions had appointed their officials to hold many positions. In any ministry, there are many directors and deputy directors. In a department, there are at least 10 deputy directors, while in the police, the military, and the military police, there are also many who are nominated as deputy directors… This makes the government to carry a burden of ever increasing expenses. “According to the notification signed by a secretary of state of the Council of Ministers, Mr. Prak Sokhon, on 21 October 2009 and sent to the Ministry of Interior, the Ministry of Defense, the Ministry of Economy and Finance, and to the Council of Administrative Reform, the Royal Government decided to delay all promotions for positions of government positions, and all promotions of ranks [for police and the military], and it will not increase any allowances [like retirement benefits] etc. for the one year of 2010, and it will reconsider these cases again in 2011. According to the same notification, the Royal Government ordered also to stop the implementation of decisions for the ‘priority cluster’ [formerly identified as important areas in the administration to receive special financial support], and additional incentives based on work achievements for 2010. “The notification added that the above plan is a measure to implement the budget implementation draft for the management of financial resources in 2010, aiming to save state resources in 2010. “It should be noted that the Royal Government decided recently also to cut and to reduce the salaries of many advisers who had been appointed in a continuing process. and who had received high salaries [in addition to their normal salaries], to get again only their normal salaries based on their current positions, in order to save resources for 2010. Apologies for the delays, which may continue until next Monday, as I was attending the UN Internet Governance Forum meetings in Sharm el Sheikh/Egypt with a busy schedule, in a different time zone, and i am now traveling back to Cambodia. I try to be timely as much as possible. “Phnom Penh: According to the Minister of Post and Telecommunication, Mr. So Khun, who spoke to journalists in the morning of 19 November 2009 at the Phnom Penh Hotel, where he presided over a workshop about the joint use of mobile phone relay and transmission towers, the Ministry of Post and Telecommunication of the Kingdom of Cambodia will set equal phone service costs at the end of this month. “The minister said that so far, the post and telecommunication sector has advanced dramatically, and it is a pride of the ministry as well as of the Cambodian government under the wise leadership of the Prime Minister of the Kingdom of Cambodia, Samdech Akkak Moha Senapadei Dekchor Hun Sen. However, together with this progress, the ministry noticed that mobile phone companies in Cambodia compete with each other over phone call costs. This is not yet considered as a conflict, but just as a sign of disagreements. Therefore, the ministry prepares to set a general cost system. The minister added that the cost that the ministry plans to set is not yet known, but the ministry is discussing to set a cost system that all mobile phone companies in Cambodia can accept.